53 Wednesday April 28th 1875. The weather quite warm today I walked to school and back I practiced till school time in the morning. And worked all the evening on another tidy I have begun. Laura went down town this afternoon. And Tom brought her out home in the evening. Thursday April 29th 1875. It was a very stormy disagreeable morning But I walked to school and back. I felt very tired. I worked all the evening on my tidy. Friday April 30th 1875. It was a chilly morning. I walked to school and back and worked all the evening on my tidy. 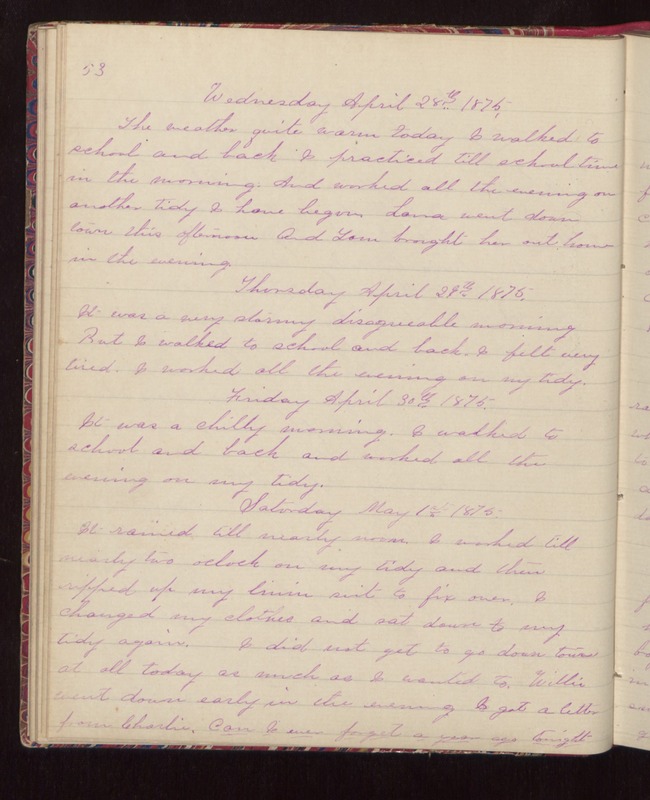 Saturday May 1st 1875. It rained till nearly noon. I worked till nearly two oclock on my tidy and then ripped up my linin suit to fix over. I changed my clothes and sat down to my tidy again. I did not get to go down town at all today as much as I wanted to. Willie went down early in the evening. I got a letter from Charlie. Can I ever forget a year ago tonight.